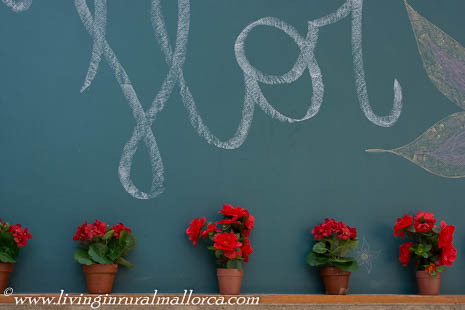 Last Friday we fell a tiny bit in love with a small village called Costitx, in the centre of Mallorca. 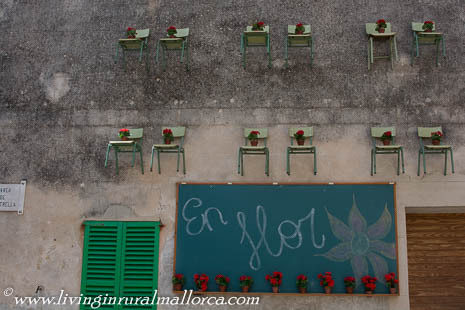 Relatively few visitors to the island will have heard of it, let alone visited, but many will have flown over it – the village being under one of the flight paths across Mallorca. 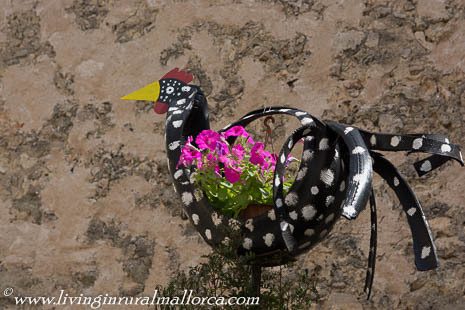 An impressive number of visitors – mainly Mallorcans – flooded into the village on May 1st for ‘Costitx en Flor’. 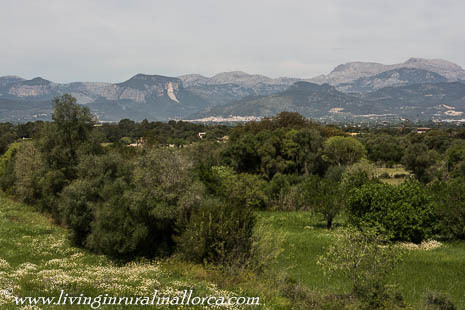 Beautiful views across Mallorca’s Pla to the mountains. We reached Costitx via a (usually) quiet country lane off the main Manacor to Inca road (between Sineu and Inca) in an area of the island known as the Pla. There’s lovely surrounding countryside and views of the UNESCO World Heritage Serra de Tramuntana. The village itself has some interesting old architecture and several beautifully restored stone townhouses. If we had to live in a village, rather than open countryside, Costitx does have its attractions . . . 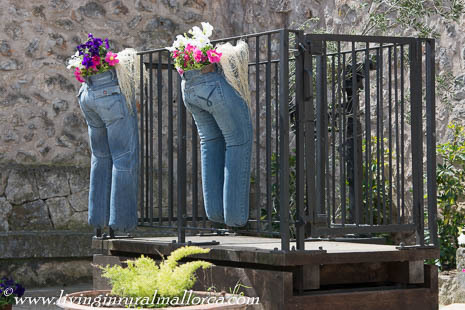 The village also has a few claims to fame – and not the sort of fame associated with the likes of Magaluf, or the more genteel mountain village of Deià. Costitx is home to the Observatori Astronòmic de Mallorca, opened in 1991. 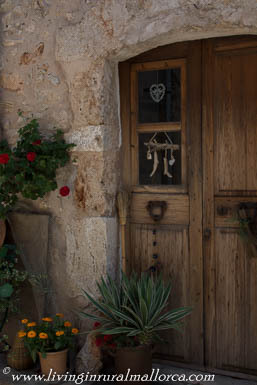 Even after we’d bought our finca – but before we moved to Mallorca – we weren’t aware of its existence. I found out about it only during a BBC radio interview I did with an astronomy expert in north Oxfordshire, who told me the observatory was “very important”. The Observatory is also home to the Mallorca Planetarium. Costitx is home to three prehistoric bronze bulls’ heads found on common land in 1894. 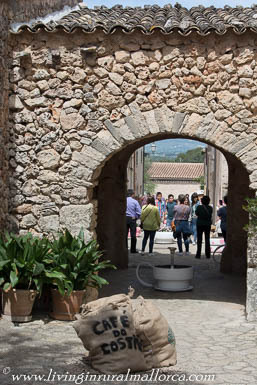 Well preserved, and part of the Balearics’ remarkable Talayotic remains, they have their 21st-century home in the Son Corró Sanctuary. 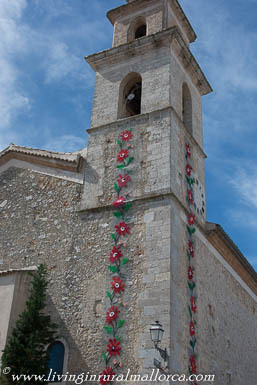 One of the streets in the village is named after these Caps de Bou de Costitx. In 1987, Costitx elected a mayor who became both famous and infamous. Every Mallorcan – and many non-Mallorcan island residents – will know of Maria Antònia Munar . 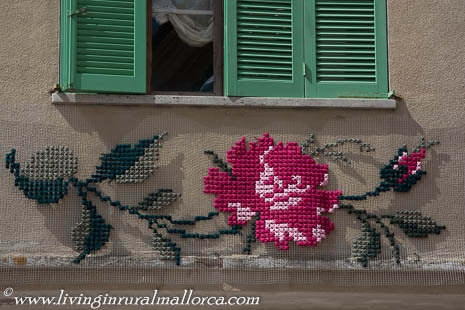 . .
Saying it with flowers: a welcome to ‘Costitx en Flor’. 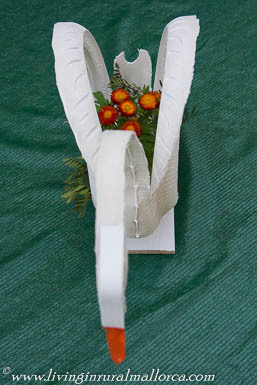 But it was last Friday’s ‘Costitx en Flor’ that wowed us. 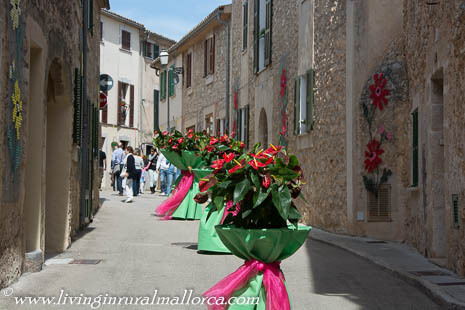 This annual flower festival sees the whole village decorated with flowers, with each street having its own themed display. The creativity of the villagers, and hard work involved in putting this event together, are evidence of a real community spirit. 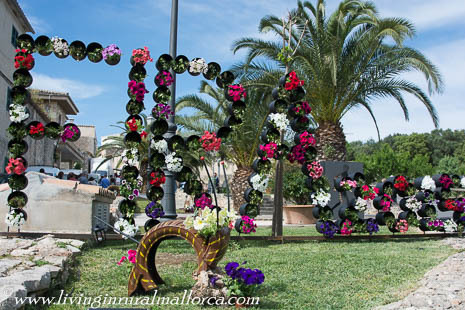 We loved it and, if you’re on Mallorca next May 1st, it’s worth a visit if you appreciate flowers, handicrafts, and creativity. 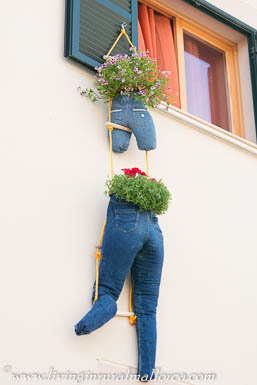 The street with the recycled jeans . . . 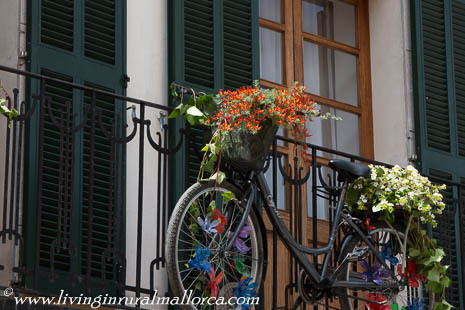 The street with the bicycle and flower displays . . .
Old tyres given a new lease of life. Streets closed to traffic – and open to floral displays. Take a seat . . . and add flowers. Once a tyre . . . now a chicken. In the doorway of an old townhouse in Costitx. 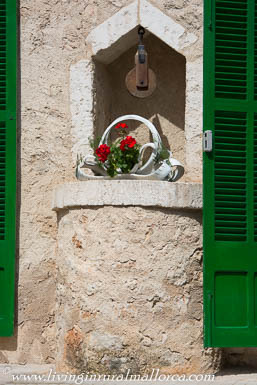 Old well outside a Costitx house – complete with flowers in a recycled tyre. Embroidery on a big scale! Archway to ‘cup and saucer alley’ in Costitx. 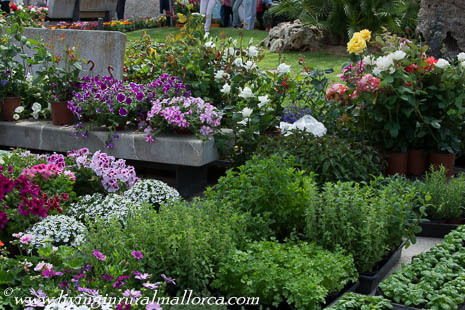 Plants for sale – for those inspired by their visit to ‘Costitx en Flor’. It was our first visit too! Well worth going, especially for someone like you, who would know the names of the flowers! Good with flowers, but not always good with the plant names! !